Are you and your group headed to Dallas, Austin, or New Orleans? Then you will absolutely need a few snacks and bottles of water for the road. Pro tip: Pack healthy, nutritious snacks of your own rather than loading up at fast food stops along the way. Something else to keep in mind is that not every charter bus company allows food and beverages (besides water) onboard. It never hurts to double-check with them before departing. This seems pretty obvious and yet many folks fail to wear comfortable clothes on long trips. We recommend slip-on shoes in addition to light, breathable clothing. Even if you’re planning on dressing up for a nice dinner or event upon arrival, opt for comfort during the trip itself. In case you’re wondering, each of our vehicles come fully equipped with dual air conditioning to keep passengers cool and relaxed. Have you ever gone on a road trip without personal hygiene items? Needless to say, it’s not very enjoyable. So remember to pack a toiletry bag with essentials such as a toothbrush, toothpaste, hand soap, shampoo, etc. This will also eliminate the need for inconvenient stops at the local grocery store or drugstore. A pair of sunglasses can make a long drive into the sun more tolerable. It’s as simple as that. Sure, you might be able to pull down the visor in front of you for temporary relief. A more effective, long-term solution, though, is to wear sunglasses. You’ll also be able to socialize easier with others when you aren’t shielding your eyes the entire time. Nothing ruins a charter bus trip quite like motion sickness. Whether or not you’ve experienced queasiness en route before, it’s not a bad idea to pack Dramamine or a similar medication. You may also consider putting some ibuprofen in your bag for headache relief. Merlo’s Charters specializes in event transportation, luxury transportation, and executive transportation. But we also have a passion for providing dependable road trip transportation for those in Houston. Part of what makes Merlo’s different is that we are family owned and operated. When you first contact us, we listen to your needs and then match you with a vehicle that makes the most sense for your group. Take our motor coach, for example. These luxury vehicles feature five TVs, DVD players, a restroom, as well as seating for large groups with luggage. Best of all, Merlo’s motor coaches seat up to 56 passengers without an issue. Over the last 20 years, Merlo’s has grown to be one of the premier ground transportation companies in southeast Texas. We even run our own maintenance facility to be certain that passengers are riding in the most reliable vehicles. 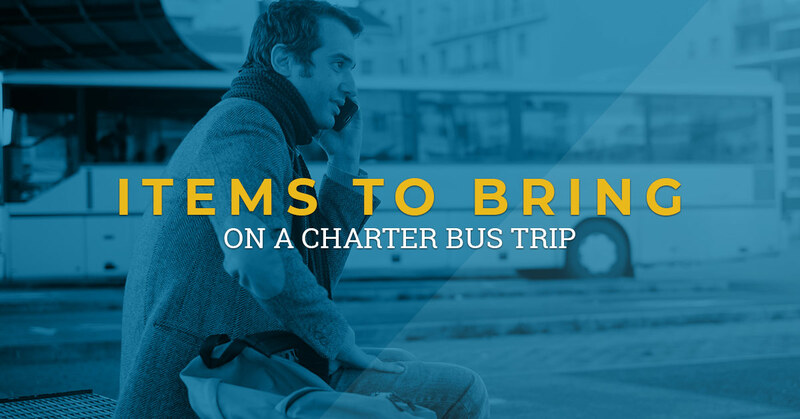 For the best charter bus road trip experience, look no further than Merlo’s Charters.